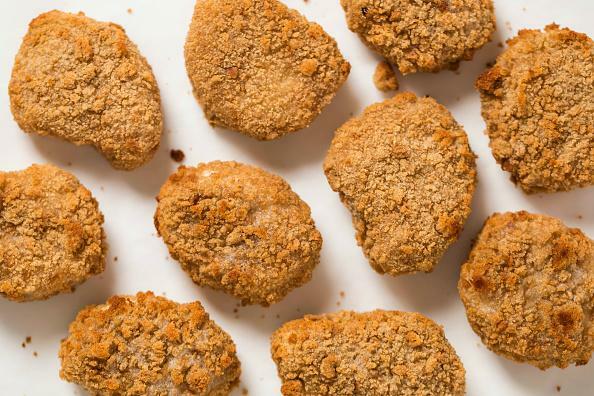 Chicken Nugget Recall 2019: What Products Are Affected? Tyson Foods (TSN) has recalled 36,420 pounds of chicken nuggets due to possible rubber contamination. The recall chicken nuggets were produced on Nov. 26 and were sold in 5-pound packages labeled Tyson WHITE MEAT PANKO CHICKEN NUGGETS. They have a Best if Used by date of Nov 26, 2019, with a case code of 3308SDL03. The chicken was time-stamped 23:00 through 01:59. Consumers can also identify the product by the USDA mark of inspection which reads P-13556. The recalled chicken nuggets were shipped to retailers nationwide. Product labels of the recalled chicken nuggets can be viewed here. Tyson said it discovered the issue when consumers complained of a foreign material in the product. No reports of illness or injury have been reported from the recalled chicken nuggets. Consumers are being urged to check their freezers for the recalled chicken nuggets and throw them away or return them to the place of purchase. Consumers should not consume the product. Questions about the recall can be directed to Tyson Consumer Relations at 1-888-747-7611. Perdue Foods has also recalled 16,011 pounds of ready-to-eat chicken nuggets for misbranding and undeclared allergens. The recalled chicken nuggets contain milk, which was not properly labeled on the package. The recalled chicken nuggets were produced on Jan. 10 and were packaged in 12-ounce packages labeled PURDUE Fun Shapes Chicken Breast Nuggets. They have a Use By date of MAR 11 2019 and lot codes of 17009010 to 19009010. The USDA mark of inspection bears an establishment number of P-369. Labels of the recalled chicken nuggets can be viewed here. The recalled chicken nuggets were distributed throughout Connecticut; Delaware; Washington, DC; Maine; Maryland; Massachusetts; New Jersey; New York; Ohio; Pennsylvania; Rhode Island; Vermont; Virginia; and West Virginia. A retail location notified Perdue of the incorrect labeling issue. The company has not received any reports of adverse reactions to the product. Concerned consumers should contact their healthcare provider. Perdue is urging consumers to check their refrigerators for the recalled chicken nuggets. Consumers should not consume the chicken, and they should throw it away or return it to the place of purchase. Questions can be directed to Perdue Consumer Care at 1-866-866-3703. Consumers can also direct food safety questions to the U.S. Department of Agriculture’s Food Safety and Inspection Service’s (FSIS) virtual representative, Ask Karen. The hotline is available 24 hours a day at AskKaren.gov or via smartphone at m.askkaren.gov. The USDA Meat and Poultry Hotline is available at 1-888-MPHotline (1-888-674-6854) in both English and Spanish from 10 a.m. to 6 p.m. ET, Monday through Friday. Food safety messages are available 24 hours a day. Consumers may also access the Electronic Consumers Complaint Monitoring System 24 hours a day at http://www.fsis.usda.gov/reportproblem. Shares of Tyson were down 0.71 percent as of 10:05 a.m. ET on Wednesday.